Abu Dhabi – July 31, 2018 - Insurance House P.S.C. (IH) registered a Net Profit of AED 6.63 million during the first half of the year 2018, which is more than triple the Net Profit of AED 2.11 million registered in the corresponding period of the previous year. This is a very encouraging sign for the Company, as the remarkable turnaround in the core business operations of Insurance House gathers momentum. Gross Premiums Written during the first half of 2018 weighed in at AED 124.59 million compared to AED 130.78 million logged during the same period of the previous year. On the other hand, Net Claims Incurred during the first half of 2018 registered a dramatic, but healthy, drop of 34.7% to AED 35.09 million compared to AED 53.71 million during the same period in the previous year. This comes as a direct result of a series of strategic and tactical measures implemented by the Insurance House Management to lower the cost of Claims Incurred across all business lines. The ratio of Net Claims Incurred as a percentage of Net Premiums Earned, registered a remarkable improvement down to 49.6% in the first half of 2018 from 70.3% in the same period of 2017. As a result of the above, the Net Underwriting Income for the first half of 2018 catapulted by 64.7% to AED 30.24 million compared to AED 18.36 million registered during the same period of last year. 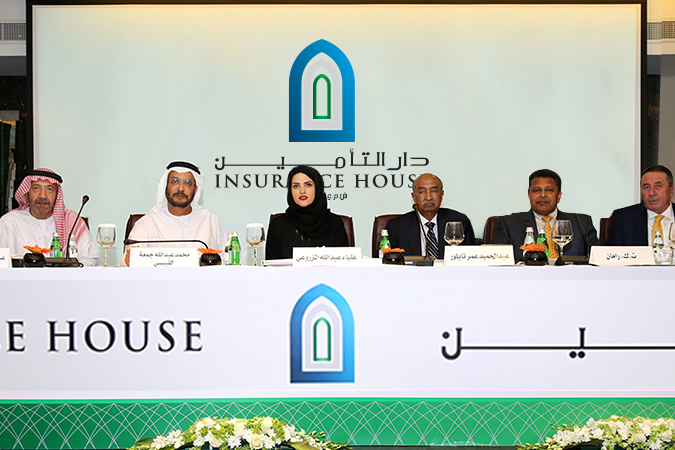 Commenting on the first half of the year 2018 financial results, Mohammed Abdulla Jumaa Alqubaisi, Chairman of Insurance House said: ”Despite intense competition, softer market conditions and elevated pressures on input costs, the Company was able to more than triple its Net Profit in the first half of 2018 compared to the first half of 2017, through well thought out strategies and their effective implementation across all business lines. We will strive to sustain our significantly improved performance throughout 2018 and beyond”. Mohammed Othman, Chief Executive Officer of Insurance House, added: “With the addition of a stable rent yielding investment property in Q1 2018, the Investment Income earned during the first half of 2018 rose to AED 3.1 million compared to AED 812k in the same period of last year. During the first half of 2018, Insurance House further expanded customer reach within the UAE through the addition of two new branches, the first in Deira, Dubai and the other inside Muroor, Abu Dhabi. This brings the total branch network in the UAE up to 8 branches, in addition to the Abu Dhabi head office. General and Administrative Expenses rose in the first half of 2018 but remain within the expenditure budget and Insurance House continues to maintain a close vigil to ensure that expenses are on a tight leash in order to ensure its continued success. “We remain optimistic of our profitable growth potential in the near future. Our strategy is to compete on the basis of innovative product offering, improved digital capabilities and superior service quality. Going forward, profits from core insurance activities will be driven by continuous fine-tuning of our risk underwriting capabilities, increased use of digital channels to extend customer reach and enhanced claims management processes”, concluded Othman.